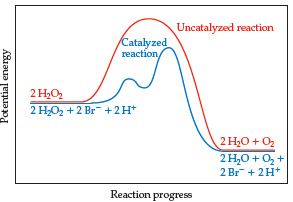 Solution: Energy profiles for the uncatalyzed and bromide-catalyzed decomposition of H2O2.Where are the intermediates and transition states in this diagram? Energy profiles for the uncatalyzed and bromide-catalyzed decomposition of H2O2. Where are the intermediates and transition states in this diagram?